I really enjoy MEAL TICKET and SATELLITE CAMPUS; CHEMICAL TESTING, on the other hand, is not as common a phrase. Still, it’s a decent theme. When I was in high school, I wanted to work at Walt Disney World and live in Spaceship Earth in EPCOT. Much of my days are spent performing OTIC exams on children who want people nowhere near their ears. SKEE BALL brings me back to childhood trips to the Jersey Shore, burning through rolls of quarters in the hopes of maybe being able to get a good prize with the tickets collected by the end of the week. (It usually didn’t happen). 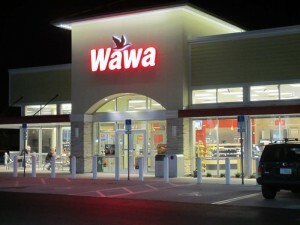 WAWA, though clued here as [Trumpet or guitar effect], is also the best gas station / convenience store ever. The name is derived from the Ojibwe word for the Canada goose, found in its logo. There’s a deli counter for fresh subs, soups, and frozen beverages, all kinds of snacks, fresh coffee, yummy local iced teas and fruit drinks/lemonades, and surcharge-free ATMs if you’re out of cash. It’s worth stopping by if you’re on the East Coast somewhere and need a snack or drink. Photo from Sara Scott’s page. That’s it for this week. 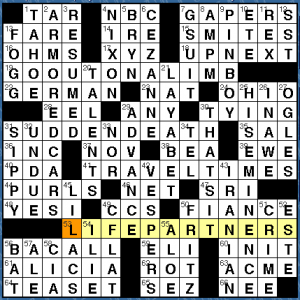 Hope you see many of you at ACPT on Friday! (The real) Sam Donaldson is back today with a heartwarming puzzle about BFFs. That is, the ends of the first three theme answers can complete the phrase “LIFE and ___”. Lively theme entry choices though TRAVEL TIMES is sub-par as a plural. Any of the following could have preceded TIMES instead: BEST OF, MODERN, LONDON, SUNDAY. Favorite fill: ARMORED CARS, HIS EMINENCE with the ambiguous clue [Cardinal reference], THAT’S IT!, UP NEXT, CEZANNE, LILACS, VESPERS, and PIN BOY. (This needs to be an Adam Sandler movie. Actually, no. No it does not. Please forget I said that.) Also, it’s nice to see the preferred IRANIAN instead of the more common IRANI. 24a [River past Cairo] is OHIO. That’s Cairo, Illinois, of Huckleberry Finn fame and pronounced “Kay-roh” or “Care-oh”. Great clue for the commonly seen state. Here are 20 towns named for other towns but pronounced differently. I smell a puzzle theme. 30a [Evening] is TYING. Combined with the clue for VESPERS [Evening service], it was hard to discern the clue’s true meaning even with the TY_ in place. 56d [Face an ace] is BAT. For some reason, even though I read the clue multiple times, I thought it said [Face on an ace]. 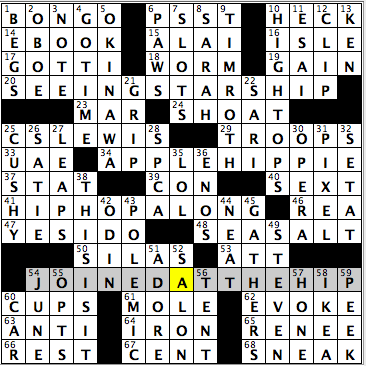 It wasn’t until after I filled in BAT that I read the clue correctly. 7a [Star-struck bunch] is GAPERS. A bit too roll-your-owny. 12d [JFK lander until 2003] is SST. Enough already! This is quite literally three days in a row with SST or SSTS. Please make it stop! A fine puzzle and theme with few drawbacks and some good, tricky cluing and fill. Oh, and if you’re looking for a LIFE PARTNER, try this site for helpful tips (with pictures!). 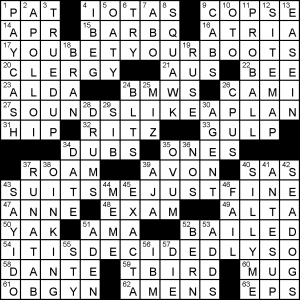 As pointed out in both 37D and 60D, you’re adding a phonetic AYE/EYE to GRECIAN URN, WEIRD AL, AWFUL BORE, OWEN MEANY, THAT’S MY CUE, and PLUG NICKEL to get the theme answers. I think some of the phonetic additions here work a little better than others, but they’re all entertaining. I think THAT’S MY IQ is my favorite of the transformations. I liked this one a lot, even if I found the upper left corner a bit frustrating. Good afternoon! 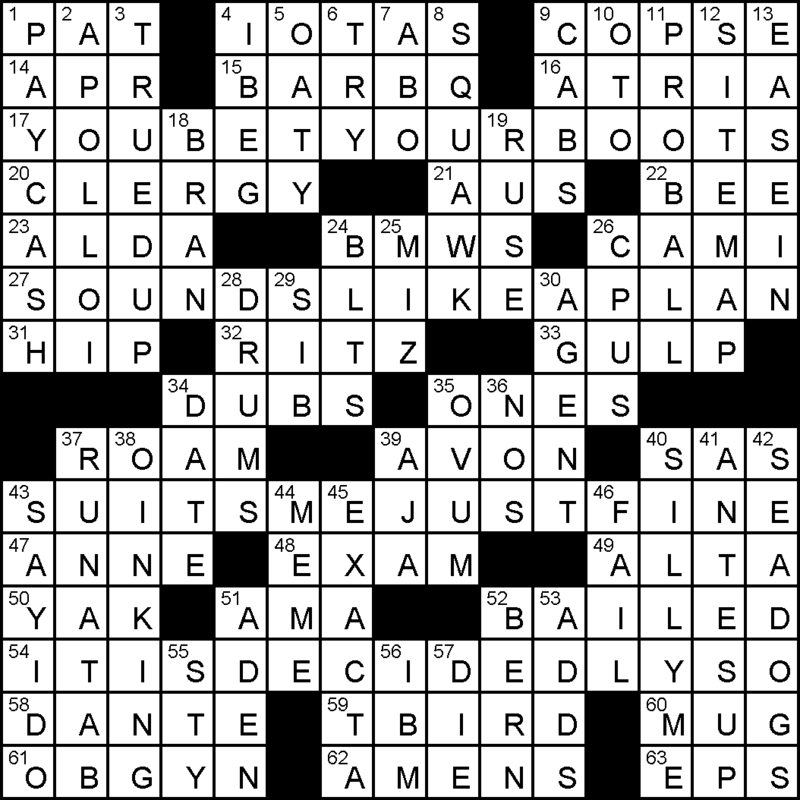 We have more fun with puns today, as the grid from Mr. Randall J. Hartman takes common phrases and alters them by adding the letters “HIP” to one of the words to create those funky answers, with JOINED AT THE HIP acting as the reveal (54A: [Always together (and a hint to 20-, 34-, and 41-Across)]). APPLE HIPPIE (34A: [Cool cat from Cupertino?]) – Apple pie. HIP HOP ALONG (38A: [Get in on a rap session?]) – Hop along. Some interesting non-themed fill in today’s grid, from OKINAWA (5D: [WWII battle site]) to HIGH TOPS, which I loved wearing as a kid but then gravitated away from those types of shoes when I got older (10D: [Retro tennis shoes]). I don’t know the cast of Modern Family all too well outside of Sofia Vergara and Ed O’Neill, so needed all the crossings to get SARAH (8D: [Hyland of “Modern Family”]). Last fall, I had an extensive interview with a professional football player, Rashad Jennings of the New York Giants, and he told me that he loved reading books from C.S. LEWIS and G.K. Chesterton (25D: [“The Chronicles of Narnia” author]). Though I’m sure talk about their works is part of regular conversation in an NFL locker room, it was a pleasure hearing that. Oh, and the same person who said that to me also said he took up archery in the offseason. Who doesn’t take up archery in their spare time?!? “Sports will make you smarter” moment of the day: WORM (18A: [Object found at the bottom of many a tequila bottle]) –Did most of you know that former NBA player/Hall of Famer/actor/cross dresser/Kim Jong-un friend Dennis Rodman was nicknamed The WORM during his playing days? Thank you, everybody! See you tomorrow. 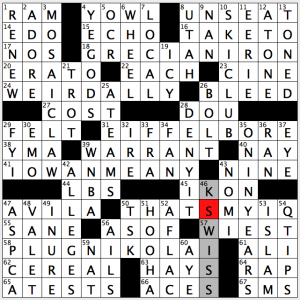 Four colloquial 15-letter phrases mean, more or less, “I concur.” That’s a simple, fun concept to build a puzzle around. There is an attempt to create consistency in how the four are clued; the first three are “Yes, to a >job title<“, but then Magic Eight Ball comes a long, and I don’t think that’s a job title. Still it’s a minor inconsistency. At it’s core, you get a theme built around four fun spoken word phrases – YOUBETYOURBOOTS, SOUNDSLIKEAPLAN, SUITSMEJUSTFINE and ITISDECIDEDLYSO. The grid design features 4 “big” corners. The best answers in those are PROBALL and SILLYME. The downside is three long “extraneous-adverb” type phrases – TRUEDUP, ANTESUP and EASEIN. De trop? I remember weighing up whether to use APOLLOI in a crossword of my own before. It’s a bit of a downer, right? Best clue? [Orders with mayo? ], BLTS – verb/noun fake-out! This entry was posted in Daily Puzzles and tagged Andrew Reynolds, Brendan Emmett Quigley, Bruce Haight, Randall J. Hartman, Samuel A. Donaldson. Bookmark the permalink. CHEMICALTESTING struck me as an unlikely phrase — I find it hard to imagine a plausible sentence using it. Thanks for the explanation of how WAWA stores got their names. They exist in Baltimore but not (as far as I know) in the Washington DC area, so the WAWA boundary lies somewhere between the two cities. But Canada geese can be seen in and around DC. Strange. Or maybe not. David – actually, there are Wawa stores as close to DC as Beltsville and Capitol Hts., and several along Route 301 south of DC. I wasn’t sure about CHEMICAL TESTING at fort either, but a quick Google search shows that it’s pretty common and idiomatic. It’s definitely not snappy, but it isn’t unnatural. I was kind of happy to see the non-partial ON OR ABOUT, even though it’s also not snappy. AVX: for the EIFFEL TOWER theme entry, the base phrase is “full bore” not “awful bore”. BUT — Does anyone else think it is a flaw that with some of the ‘I’ sounds, the entire syllable disappears — Weird Al, Owen Meany, Plug nickel, That’s my cue; whereas in other theme entries, the I sound mutates into something else — Grecian urn, Awful bore? I don’t see that flaw. It’s just adding an “I” sound. If you pronounce iron as “i-urn” (and I do), it works. And like anon said, it’s “full bore,” so I + full = EIFFEL. I (along with most North American English speakers) pronounce “iron” as “i-urn,” so I think GRECIAN IRON works fine. Mileage may vary for other English dialects and varieties. Should have been clearer: I was correcting the information provided in the review, not commenting on the puzzle itself. Full Bore becomes Eiffel Bore, not Awful Bore becoming Eiffel Bore – I don’t think “Awful” comes into play at all here. That said, I did notice the sound change with this one (full v. the “fel” in Eiffel) and with O-wen -> I-o-wan, but it didn’t bother me much. I thought Brendan’s AVX puzzle was quite good and I’m surprised by its underwater rating. What did people dislike about it? 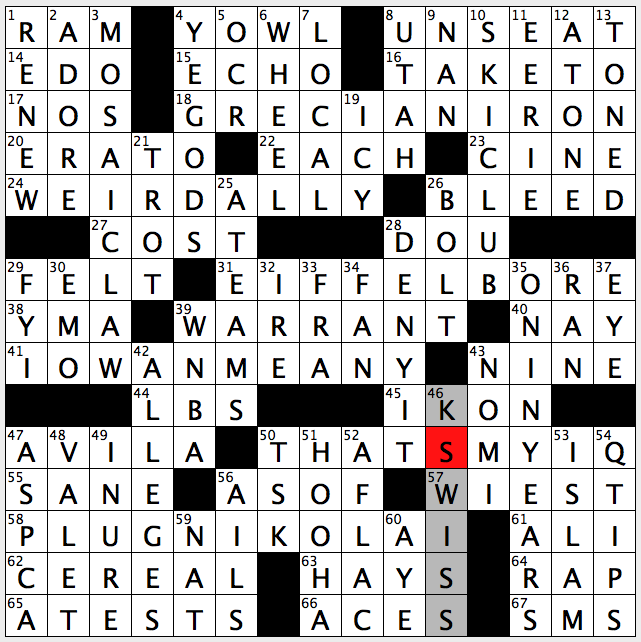 Quick question – do the WSJ daily puzzles get harder every day like the NYT and LAT ones? Yes, for the most part—Thursday being the most difficult. The Friday contest (meta) puzzle may follow a pattern in difficulty, but I haven’t been able to discern it. The Saturday is a 21x and is about the same level of difficulty as a Wednesday. For my experience, it varies. Mon-Tues is what you expect. Wed-Sat are toss-ups which are about a Wed NYT type difficulty. 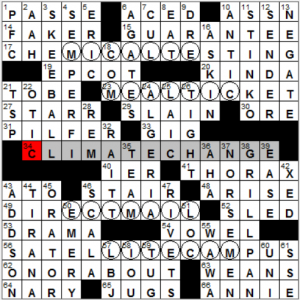 Usually though there’s two “harder” grids, but they’re out of sequence and not always on the same days. Last week, the two “hard” grids were Wed & Sat (in that order) for me. It just depends. NYT Will someone explain how W in Welsh is a vowel? It’s often pronounced oo, like our w sound without the last bit. If you say our w sound, “wuh” very slowly, it sounds like “oo-uh”. The Welsh w is just the oo bit. Example: the word “cwm” which means “valley”, is pronounced “koom” and rhymes with boom. I’m not Welsh nor a linguist; this is just my observation. The letter written ‘w’ *is* a vowel in Welsh — pronounced, I think, like the vowel sound in ‘root’. Bruce — your “root” isn’t a good example, but “boot” is clearer. Many areas in the U.S. will rhyme “root” with “soot”; and “roof” is another with two distinct pronunciations, one rhyming with “hoof”. Can anyone give me a little tech help? I am on a MacBookAir using Chrome. Until today, when I went to my bookmark for http://www.crosswordfiend.com I would get the current posts. Now I seem locked into Tuesday’s post and have to find a new comment to link on to to get to today’s post. I don’t think I have changed any settings so I’m not sure what is happening. ????Suggestions?? ?